Autumn is all about trees, the colours of their leaves turning gold and crimson before falling to the ground for you to crunch underfoot (or roll about in, depending on your energy levels!). The broadleaf hardwoods are responsible for this vibrant seasonal display, and here at Westport House, we are lucky enough to have lots and lots. Visitors love to stroll around the estate’s beautiful woodlands, especially at the time of year, and so in this month’s blog, I’ll give you an insight into their fascinating history and our plans for their conservation and regeneration. The 100 acres of magnificent broad-leaved woodlands form one of the estate’s most defining features. They were designed and specifically planted to a naturalistic style to generate sweeping vistas of the estate grounds and frame views of the house’s elegant architecture and the natural beauty of Croagh Patrick and Clew Bay. They were also planted to create a magical setting for woodland pleasure walks, allowing lords and ladies to take their ‘daily constitutional’ and filling visitors with awe and wonder. The woodlands also had a few important practical functions. Firstly, they acted as an energy supply in the form of firewood for Westport House and the numerous associated buildings. The team of foresters needed to keep the 100-plus fireplaces going each winter – that’s a lot of work, what with chopping trees down, blocking firewood, drying it for a season and transporting it to the house! Secondly, the woodland produced a plentiful supply of timber for building and repair work, both for the estate and as a produce that could be sold to Westport town and its surrounds. Lastly, the woodland acted as a wind break for the heavy westerly winds that blow in from the Atlantic. Without the trees, all those beautiful windows might not have lasted, and the gardens would certainly have been flattened. The woodlands further define many of the boundary’s of the estate, including The Quay wall, the wind break for the walled gardens and along the western sea front at the quays. The English stylised parkland landscape in vogue at the beginning of the 1800s was characteristic of the ‘Capability Brown style’. Lancelot ‘Capability’ Brown, an acclaimed and hugely influential English landscape architect, designed over 170 gardens surrounding the finest country houses and estates in Britain, many of which still endure. (He was nicknamed ‘Capability’ because he would tell his clients that their property had “capability” for improvement.) Westport House is one of the finest examples of his design style in the west of Ireland. Much of the woodlands were planted in the late 17th and early 18th centuries, around the period when the on Westport House was built in 1734. Additional large-scale planting took place again in the 19th and early 20th centuries. During our research into the forest managers’ records between 1900 and the 1930s, we made one very interesting observation: The species choices were very strategically thought out. To the western seaward side of the estate, the tree planting is predominately sycamore, due to its hardy nature and capacity to withstand salty winds. As one goes deeper into the estate, the variety of species increases inline with the distance from the coast. The most common species are oak, sweet chestnut, lime, beach, sycamore, Sitka spruce and Scots pine, all of which can be seen throughout the woodlands. We are currently undertaking a full tree survey of the woodlands in preparation for their restoration. As you can imagine, it’s quite an undertaking – but a very enjoyable one! On the front lawn we have already started new specimen-tree planting of oak and lime. All the trees were bought from Irish suppliers and planted in March of this year. Over the coming winter season, many more new trees will be planted to ensure that the original landscape design is preserved well into the future. Look out too for some unusual specimen trees which we plan to plant around the curtilage and front lawn. The idea is to plant trees that will, in time, replace the older ones as they die back. 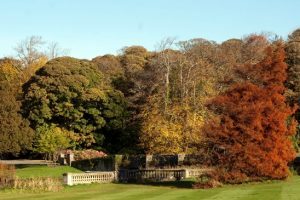 We reckon that the trees on the front lawn were planted around 250 years ago, due to their impressive trunk sizes – some are the largest in Ireland! Unfortunately, all good things eventually come to an end, and so it is with nature’s giants. Still, our conservation work will ensure they lead the longest and healthiest lives possible, while our planting will ensure that a new generation of broadleaves will stand ready to take their place. Oisín is a qualified landscape architect with a masters degree in construction project management. 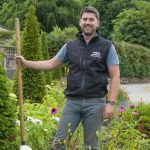 He placed in Bloom twice and starred in RTÉ’s Super Garden. For fun, he enjoys surfing, running, biking and all things outdoorsey. Oisín worked his way through college – for five summers – in Westport House. You are doing a wonderful job guys. I am so fortunate to be able to walk through the estate almost every day with my dog Tilly and to witness the great work being done on the garden and woods. It’s looking more beautiful now with the lovely changing colours of the trees. Thanks for the lovely message AJ, it is great to see you and your gorgeous doggie walking through. See you soon.